All text and photos Copyright © 2006-2016 by Wandering Chopsticks. All rights reserved. You may not copy my photos or text without my permission. You may not use my content for commercial purposes. If you wish to reprint any part of this blog, you must observe the following Copyright and Attribution Requirements. Thank you! I firmly believe that in order to encourage people to try new foods, one has to demystify it so that nothing seems terribly "exotic," and thus, inaccessible. Many of the foods that I know and love may be new to you. Many of the techniques I learned by helping my grandmother and mother in the kitchen. 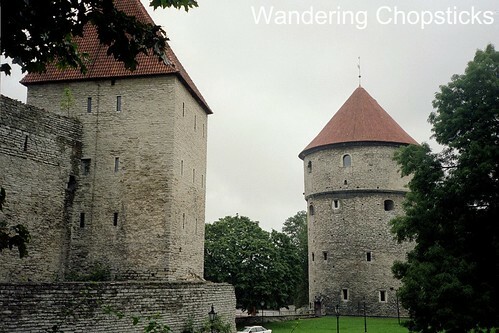 On the Right: Kiek in de Kok (Peek in the Kitchen) Tower, Tallinn - Estonia. I toyed with calling this "kitchen essentials," but really, there are so many ways to cook and ingredients to use. Instead, this is a "peek into my kitchen." This is simply how I do things and what I like to keep on hand. Here, you'll find my preferred brands of nuoc mam (Vietnamese fish sauce), Chinese thick black sauces, and banh trang (Vietnamese rice paper). Essential kitchen skills such as how to make Canh (Vietnamese Soup Broth). Techniques on how to Chop and Prepare Sugarcane. Directions on how to Season a Wok. How to identify various Vietnamese foods such as herbs, noodles, or desserts. Or just general information about the various ingredients, packaged or prepared, that I keep in my kitchen. This category is broken down into guides, how tos, ingredients, and tools. When relevant, I've listed my preferred brands. They are not an endorsement, merely what I like. My preferred brands are often chosen based upon what my grandmother or mother had in their kitchens, or based upon availability, price, and relative value. This page is a constant work-in-progress for me. I'll update it when necessary. You'll find a link to this page at the top of the navigation bar or see all posts by clicking the label "Peek in My Kitchen." In case you're interested, I prefer to do most of my Asian grocery shopping at the San Gabriel Superstore. I hope this helps you explore and love Vietnamese food as much as I do. This is way cool. I love to look in the pantries of really good cooks. Great idea! I'm sure you get a lot of emails from people about ingredients, techniques, etc, so now you can point them here :-) And I'm like Mary; I love looking into people's cupboards. thank you so much for this! i will refer to this over and over again! Excellent post and most useful, thank you! Thanks. I like peeking into other people's kitchens too. I do get a lot of emails and don't have time to respond to them nearly as fast as I wish I did!